Getting close to a Komodo Dragon was Rob’s child dream. I know it sounds weird, but since his mom gave him a National Geographic magazine with an article about the Komodo National Park in Indonesia, he has been dreaming of visiting this part of the world. Took him 20 years, but finally he was going on a trip to Komodo Island, and not only to get close to the Komodo dragons, but also to do a bunch of adventurous activities. I went on a group trip around Indonesia, and while I was cruising the jungles of Borneo searching for orangutans, and exploring the underwater paradise of Wakatobi, Rob was in Bali doing his best: surfing and blogging. 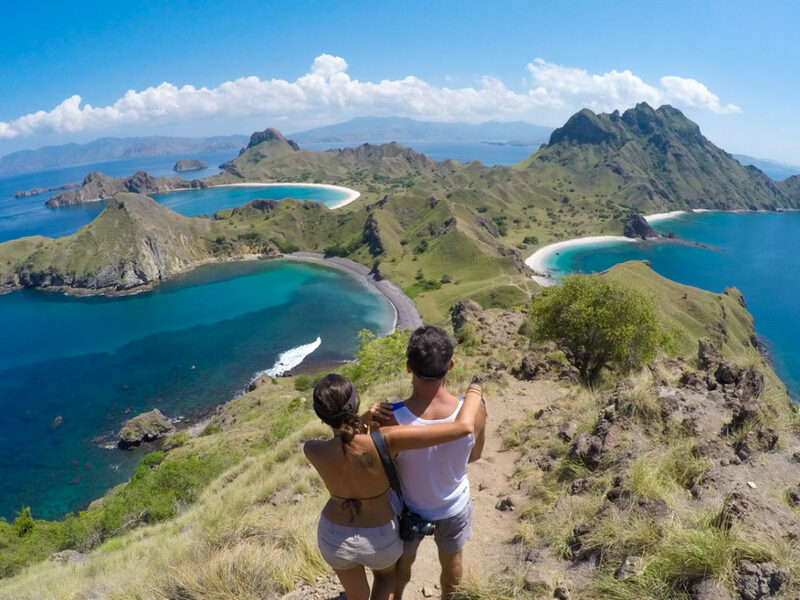 But after 10 days apart [the longest period we have ever stayed far from each other] he joined me, and together we crossed off two items from our Indonesia travel bucket list: a trip to Komodo Island and the spectacular trekking in Padar Island. This post is all about turning travel dreams to reality. After an amazing trip to Komodo Island we decided to publish this practical and inspiring travel guide to help you to plan your dream trip to the Komodo National Park, and enjoy the nature in all its glory. Located close to Flores Island in Indonesia, the Komodo National Park is much more than dragons. It’s a place with unique fauna and flora, beautiful from the top of the mountains to the bottom of the sea. So, what are the amazing things to in Komodo Island? How to get to Komodo? Where to stay in the National Park? Can we get close to the Komodo dragons? Is it risky?? The answer for all theses questions and postcard photos will convince you that Komodo Island must be your next holiday destination! The Komodo National Park is formed by three big islands: Komodo Island, Rinca Island and Padar Island, plus a few other islets, a total of 2,321 Km2 of protected land and sea. On 1986, Komodo National Park was declared World Heritage Site and Man and Biosphere Reserve by Unesco, because only in this area we can find the Komodo dragon, the largest species of living lizard in the world. An estimated total of 5,700 dragons that call this stunning part of Indonesia as their home. Put your trekking boots on, get a hat, a bottle of water and follow the rules. Rinca Island is the second biggest island in the Komodo National Park, and has the second biggest population of Komodo dragons. From Labuan Bajo [the closest tourist town] to Rinca Island took us approximately 2 hours on a speed boat. It’s a long and enjoyable trip, we passed by stunning islets, calm bays and cruised through a beautiful deep blue sea. At the island we received our first instructions: don’t look directly to the Komodo dragon, keep you head down, walk only in the trail, stay together with your group, one ranger goes in the front the group and the other in the end. Never go to the toilet alone, and girls on their period need extra attention and double security, as the dragons can smell the blood and might attack. We wanted to get close to a Komodo dragon, but at this point I was pretty sure we should avoid them. And to make the adventure a bit more exciting, our guide [named Komodo Kevin, what I loved] told us that the dragons are venomous. Plus some deadly snakes that are living free in the island. And you know what was the worst?? After all that frightening talk, Rob’s eyes were shining of excitement. Like a kid, he was ready to trek and find some wild Komodo dragons. 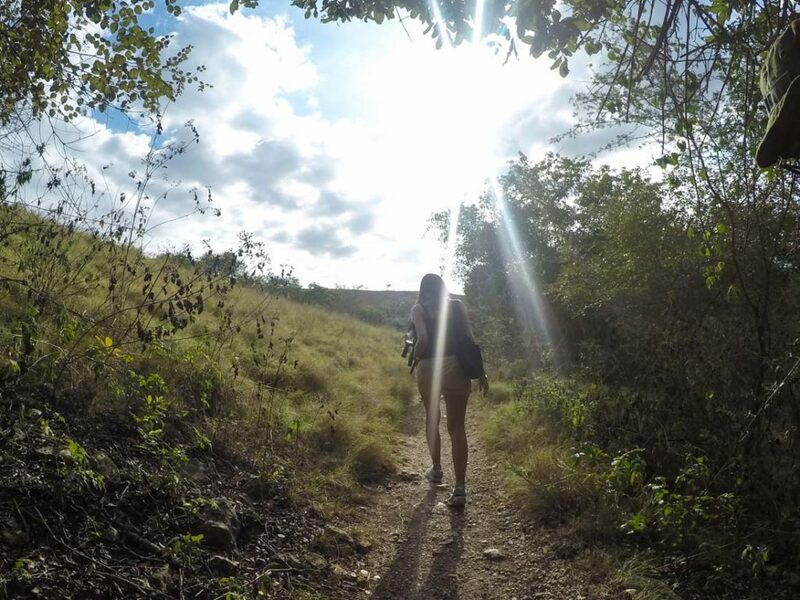 The trekking in Rinca Island was beautiful, the views we got from the top of the hills were stunning and our encounter with the Komodo dragons was more peaceful and gentle than I expected. They were in the mating season, with the females protecting nests, getting ready to lay eggs between August and September. We spotted two female Komodo dragons guarding the nest, and we found some lazy males sleeping by the ranger’s dormitory and kitchen. The males were quiet because they were still digesting their last dinner, a water buffalo. The trekking in Rinca Island was easy. The terrain was fine, and it wasn’t a long trek, about 1 hour and a half walking in the park. The heat was tough, so don’t forget to bring your sunglasses, a hat and sunscreen. 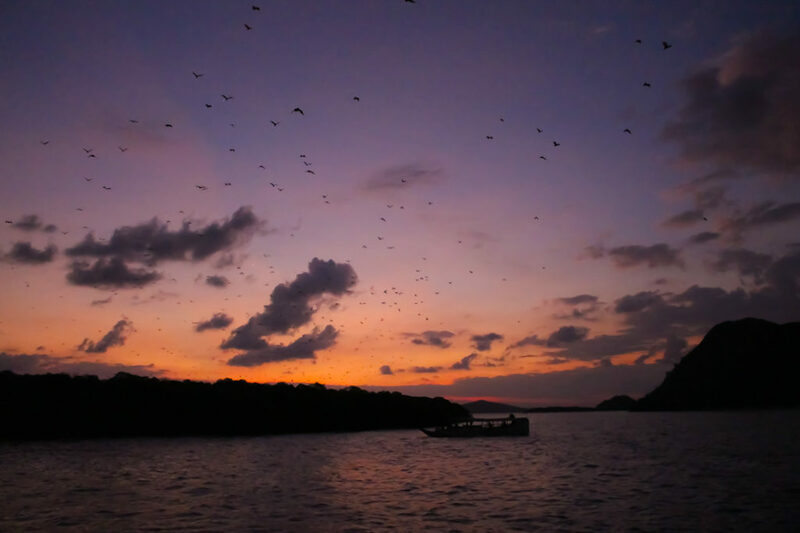 Probably you are thinking I’m crazy to tell you that one of the top things to do in Komodo Islands is to go bat watching. To be honest, that was my reaction when our guide mentioned it, especially that I hate bats [and I’m afraid of them]. However I was dead wrong, and I can tell you, don’t skip the bat watching, it’s one of the most amazing sunset experiences you can have. After the trekking in Rinca Island our boat cruised to the Pulau Kalong island where we stopped in the middle of the sea. I hate bats, but I love sunsets, so I decided to seat on the top of the boat and grab a cold beer. With a premier view, I witnessed the sky become orange, the sun disappeared in the ocean and suddenly hundreds of giant bats started flying from the island in front of us. It was magical! It was spectacular to see those huge bats [also called flying foxes or fruit bats] flying graciously and in a deep silence. We could see those dark wings contrasting with the orange sky, a scene I never thought I would see. 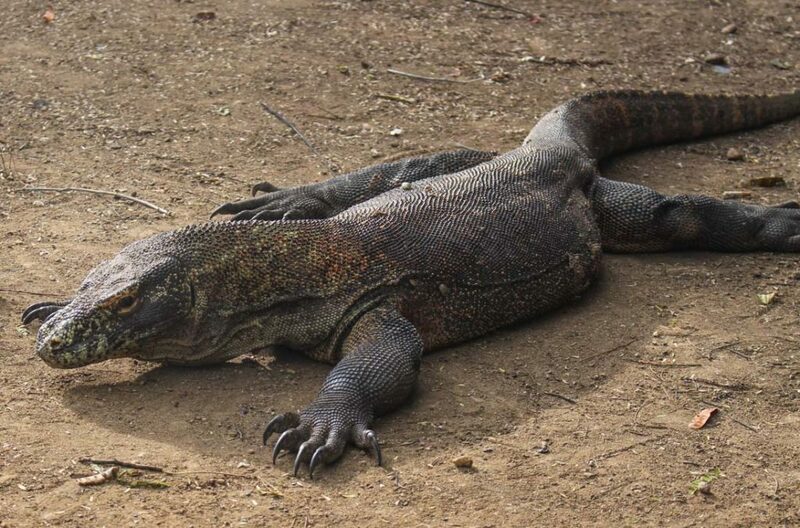 The first day of our trip to the Komodo Island was all about dragons and wildlife. The second day was all about my travel dreams, so early morning we jumped on a boat and cruised to Padar Island. Our two hours boat trip from Labuan Bajo to Padar Island was filled with sunbathing, dolphins swimming along the boat and some water splashes. During my adventure trip in Indonesia I think I have spent more time on boats than on land and loved it! When we anchored in Padar Island, the hills seemed to be way higher than I expected. I read it was supposed to be an easy trekking, but it looked way steeper than I imagined. Shoes on and let’s do it. I was there for the view, and I wouldn’t leave without my dream photo. To reach the summit we walked almost one hour. The terrain was tough, sandy and with some loose rocks, you need strength and balance to keep moving up. But for every step, every meter you go up, the view you get from the island and the beaches around gives you the power to keep moving. You gonna sweat, you gonna be tired, and you gonna be in ecstasy when you arrive at the top. So far, one of the most rewarding trekking trails I have ever done. Checked! Padar Island hills you are mine now! After all that exercise, it was time to rush down for a well deserved and cooling sea dip. The second day of our trip to Komodo Island was only beginning. Ready for more dragons? The Komodo Island is the biggest island in the National Park and has the biggest population of dragons. What means that Rob was excited again. Our guide reinforced all the rules we learned during our trekking in Rinca Island and we were ready to go. We got off from the boat and followed the rangers, a quick stop to snap a photo with an old dragon. While we were taking photos our group split. Suddenly it was Rob, me, Valerie, the old dragon sleeping by our side, and a young dragon turning some trash cans about 20 meters from us. We saw our group far away, walking towards the beach. OMG, we were left behind, and without a ranger!!! Our reaction was to walk in line, Rob looking in the front, Valerie and I looking to sides and to the back. The adrenaline rush made us walk fast, and in a few minutes we reached the group, just in time to witness a huge Komodo dragon walking on the beach and eating fish. SCARYYYYYY!!!! As I said before, a trip to Komodo Island is packed with adventure and natural beauty, and Pink Beach is the perfect combination of both. This little piece of paradise is famous for the pinkish sand, a mix of white sand and little pieces of red corals brought by the waves. 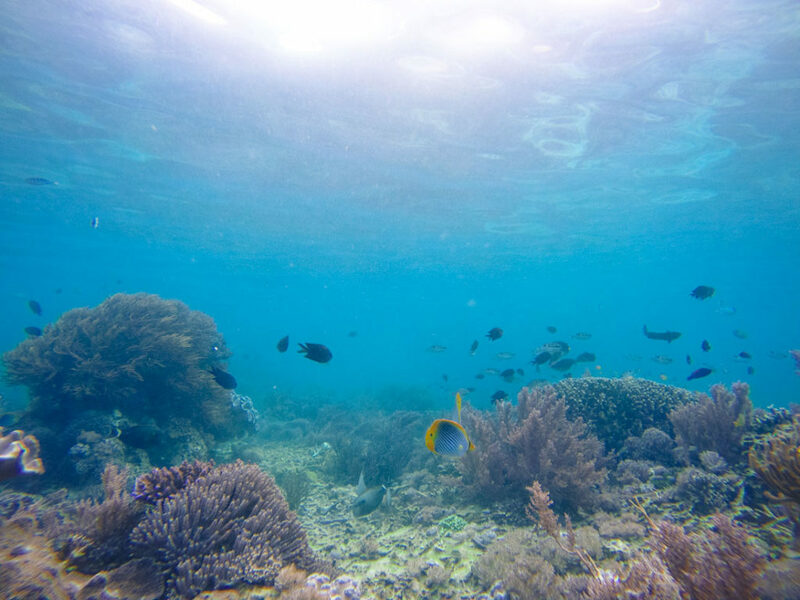 A surreal scenery, with a transparent warm sea, and an immense amount of colored fishes and preserved coral. The trees by the beach make it the perfect spot for relaxing and sunbathing, but if you are still seeking for more adventure, Pink Beach won’t disappoint you. It’s time to discover the underwater biodiversity of Komodo National Park. In Pink Beach or close by your can do snorkeling and scuba diving, pick your favorite and enjoy hours of fun. Some friends went diving in Komodo National Park and loved it. They dived in the Manta Alley point searching for Manta Rays. Unfortunately, they didn’t see the Mantas, but ended up swimming with sea turtles and even a shark came to say hello. As I’m not a diver, I stayed at Pink Beach for some serious snorkeling. Hours swimming with fishes, beautiful corals and with great visibility. I couldn’t believe how rich and preserved the corals are and only a few meters from the shore. A happy surprise that kept Rob and I busy for the whole afternoon. The Komodo dragons are the main attraction of the National Park, but snorkeling and diving in Komodo Island come in second place, attracting many travelers every year. How to Plan a Trip to Komodo Island in Indonesia? To start planning your trip to Komodo Island you first need to think about time. 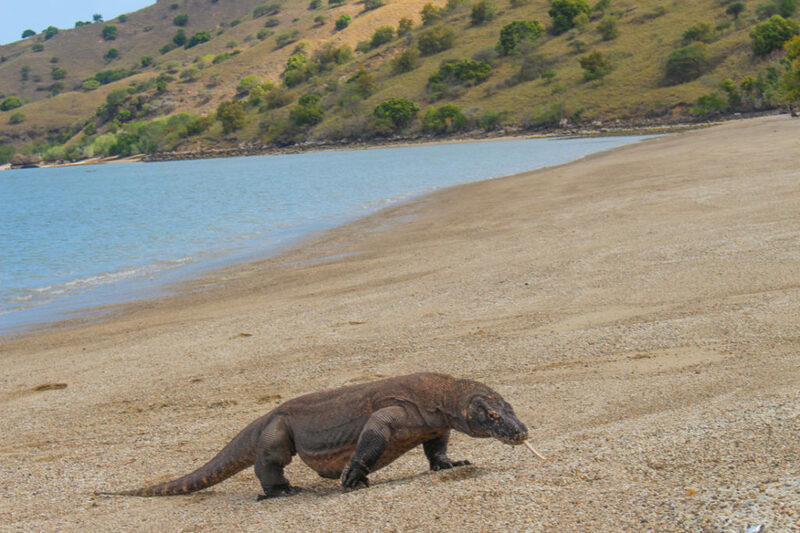 The best time to visit the Komodo National Park is during the dry season, from April to December. 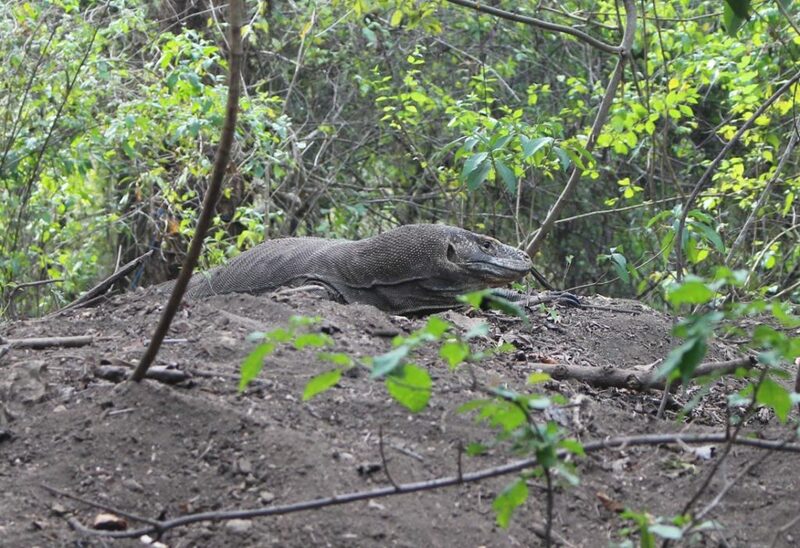 You can trek in the park and see the Komodo dragons all year around, although between July to August and September to November the dragons are less active due to the mating and nesting seasons. I was there in July, the weather was perfect, hot, sunny, and we got to see some dragons, overall it was a great experience even being during a quiet month. Second important question: how long should be your trip to Komodo Island? We spent two days and a half in the park and it was enough to enjoy the top attractions of Komodo National Park. I would say to do at least a two days trip from Labuan Bajo to the Komodo Islands, then one more day to relax. If you are going to the National Park for some serious diving, I suggest staying a bit longer. > How to get to Komodo Islands? The closest town to the Komodo National Park is Labuan Bajo, a tiny fisherman village that is also a growing hub for tourists. There are daily flights from Jakarta and Bali to Labuan Bajo, and I would suggest you to book an early morning trip so you can arrive in Komodo Airport before midday and still enjoy the park. You can search and book your flight to Labuan Bajo via Skyscanner, they have many Indonesian local airlines listed, you can compare prices and choose the best for you. Skyscanner is also a good option for booking your tickets in and out Indonesia. Another great tool is Kiwi.com very visual to find nearby airports. Once you arrive in Labuan Bajo airport you can take a taxi to town, or be smart and ask your hotel to pick you up. > How to choose the best Komodo Tour from Labuan Bajo to Rinca & Padar Island? You can only visit the Komodo National Park with an official guide and a park ranger. So you need to book a tour operator that will organize the boat trip between the islands, the guide, and also to handle the park fees. There are many tour companies in Labuan Bajo, you can arrive there and browse around till you find one that suits your travel plans and budget. Or you can book everything in advance and start your trip to Komodo island saving time and energy, here you can find a list of the best tours from Labuan Bajo to Komodo Islands. To plan the costs of your trip to Komodo Island keep in mind that a speed boat tour is more expensive than the wooden boat. And if you want to cut the expenses, a tour on a shared boat can be a good option. 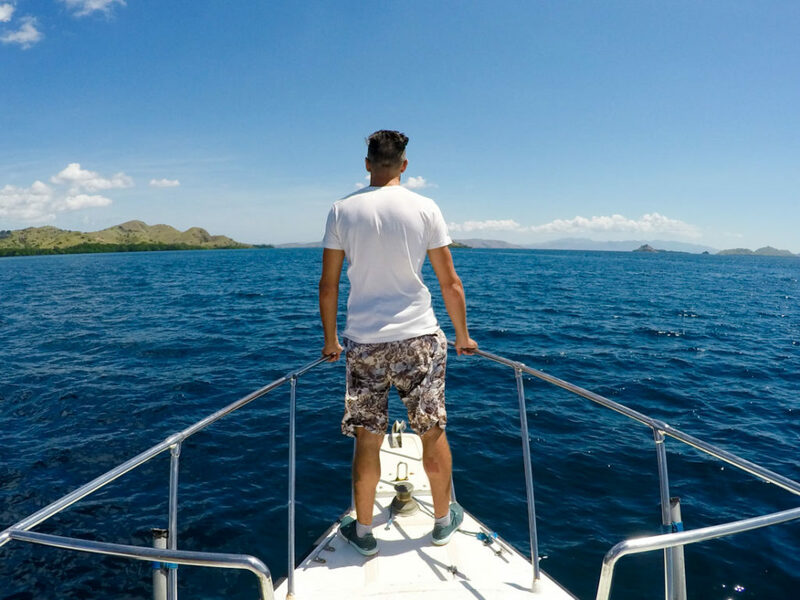 The Komodo Tours from Labuan Bajo can cost around 750 usd for a private speedboat or 100 usd for group tour [prices including meals and snacks]. On top of that, you need to add the Komodo National Park entrance fee [11usd weekdays and 17 usd on weekends]. Depending on the activities you want to do in the park you also need to pay additional fees, nothing major, for scuba diving, the most expensive one, the fee costs about 2 usd per person. Where to stay in Komodo National Park – Labuan Bajo? Labuan Bajo is a tiny town, and it’s the best place to stay in the Komodo National Park. The accommodation in Labuan Bajo varies a lot, from hostel to resorts, with some middle range options too. The best websites to search and book a hotel in Komodo Island are Booking and Agoda. Before booking your hotel in Labuan Bajo read the reviews carefully to check the location and what is included. As you will be exploring the park during the whole day I suggest you to book a room with breakfast so you won’t spend time looking for a place to eat before boarding on the tour. We stayed at Laprima Hotel in Labuan Bajo and we had great nights. The room was spacious, clean, with our own balcony and a fantastic sunset view. If you want to spend some time in the hotel, you can enjoy the pool, the garden and the beach front. Breakfast was good and the staff helpful. It’s a great value for money, all you need for an adventure trip without spending a lot! Pack light, the aircrafts flying to Komodo Island are small, and the luggage allowance is smaller than international flights. If you suffer from seasickness bring some medicines. You gonna spend at least half of the day cruising between the islands. A strong mosquito repellent sunscreen, sunglasses and a hat are a must. Remember to bring everything with you on the boat. You don’t need to bring proper trekking clothes to your trip to Komodo Island. Swimsuit, shorts and t-shirts are fine but a pair of running shoes or trekking boots are essential. You must protect your feet, especially when trekking in Padar Island and Rinca island. Bring your camera gear! A good zoom lenses can help to capture a close-up shot from the dragons, and the fisheye lenses are perfect for those landscape photos on the top of the hills. Don’t forget the underwater camera, we used our GoPro Hero4 and took stunning pictures. Now the most important advice: always follow the park rules and the rangers instructions. And never forget, respect the animals and protect nature!! Do you like the post?! Pin it for Later!!! Are you ready for this ultimate adventure? Now it’s you time to plan a trip to Komodo Island! Choose your travel dates, book the flights, the hotel and the tour. If you still have doubts about how to travel to Komodo National Park ask us in the comments below. 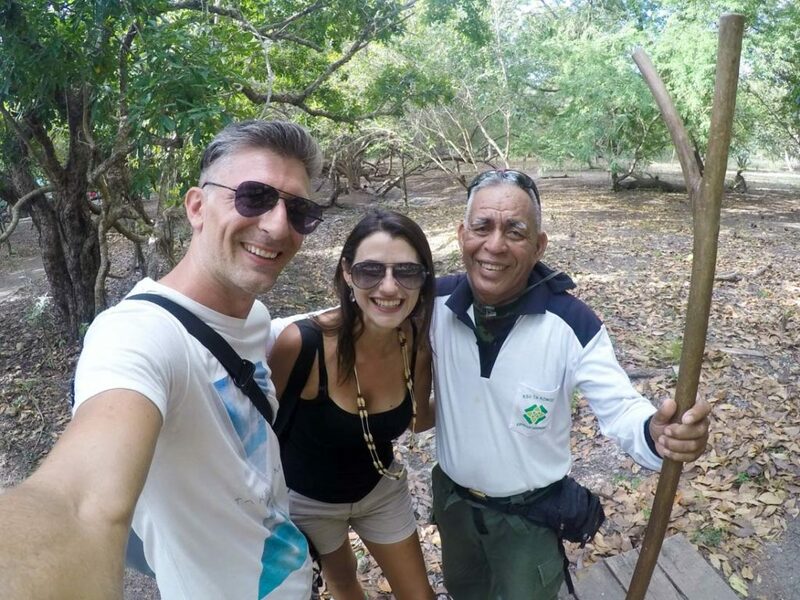 Also share your Komodo travel experiences, we love to hear great stories!! PS: This trip was organized by the Indonesian Ministry of Tourism. As usual, doesn’t matter who pays the bill, you receive my honest opinion and impression. Wow this looks like a beautiful place to visit! I’ve never been to Indonesia let alone Komodo Island but this post definitely piqued my curiosity! Indonesia is a wonderful country, with outstanding nature and diverse culture. I spent two months travelling there and have the feeling that I need to go back soon. So much to discover and unique experiences to have. Definitely Komodo was one of the best adventure trips I have ever had. I really loved Indonesia, had a wonderful time there. And you should visit Komodo as soon as possible!!! Wow the security measures that need to be taken are crazy! 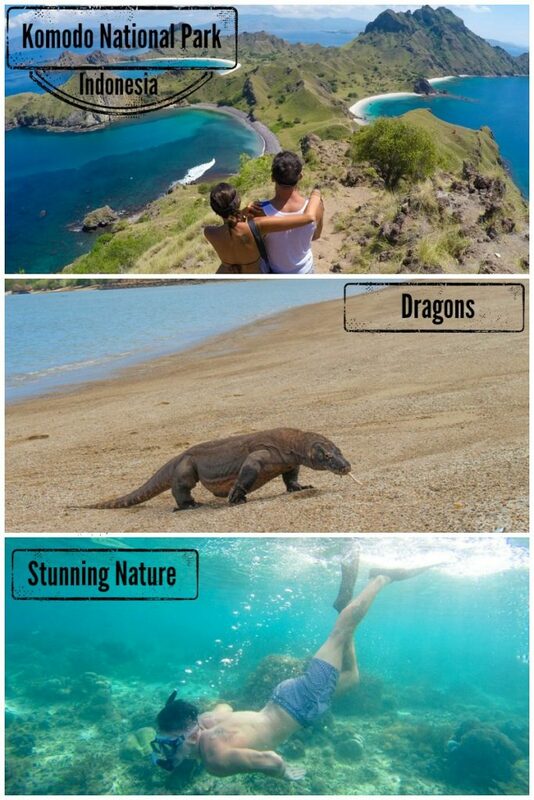 Komodo island sounds like a fascinating place though ! That’s true Claire, the security measures are crazy. But it’s totally worth to follow the rules and enjoy the Komodo experience. 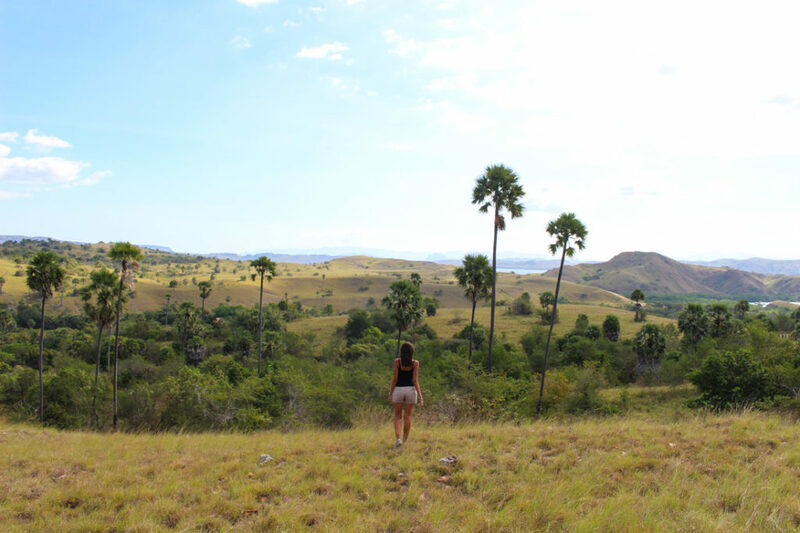 This post has made me kick up Komodo Island up my list! I have been dreaming about this and I never had the chance to go when I went to Indonesia because I mainly stayed in Bali that time for my honeymoon. Komodo Islands are such an incredible experience, a trip of a lifetime. Thanks for the super informative post on visiting the Komodo Islands! I’ve heard of the pink beach and the dragons, but bat watching sounds amazing as well! Your photos are absolutely phenomenal too! The Komodo National Park is beautiful, from the top of the mountains to the bottom of the sea. I’ve been to Komodo last year and loved the entire experience. Didn’t have much luck to see dragons guarding the nests though, only the lazy ones near the buildings. Watching bats flying out at sunset was one of my highlights of the trip, it was surreal! Good to know you loved the bat watching too. For me it was such a weird attraction, but when you see it happening it’s surreal indeed. Wow so gorgeous. I will keep in mind to keep that DEET on deck. Please Holly, don’t forget the mosquito repellent… Those nasty mosquitoes can ruin your trip to Komodo Islands. What an incredible place. I cannot believe that these beautiful animals still exist! Must be an amazing experience! It was an incredible experience Anita. They are so prehistoric, so “Jurassic Park”, that it’s hard to believe they are real… Until the moment they start moving and then you realize how scary and dangerous they are. We read about Komodo being a divers paradise, but didn’t know about the part above the water. Will be adding this to our list “Next trip ideas”! 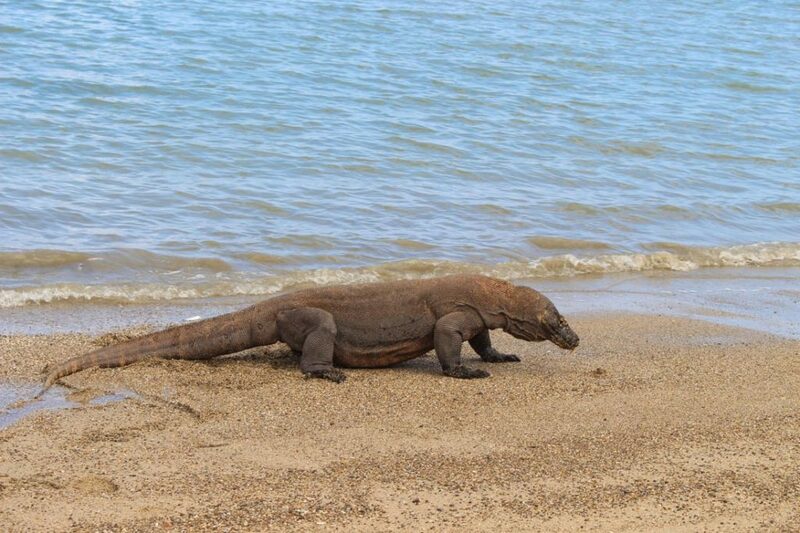 We’ve seen goannas at Whitsunday Beach, but those komodo dragons look even more impressive. Awesome post, thanks for sharing! Please, go to Komodo Island, it’s a stunning place, under and above water. It’s a unique experience, wildlife and landscapes that you can only find in this part of Indonesia. I’m loving the marine activities! I would love to do scuba and snorkeling there. The snorkeling in Komodo National Park was insane, amazing! My friends who did the diving told me that was one of the best dive they did in Indonesia… So if you have the chance go for it. What a great post you guys! When we visit Indonesia, we’re absolutely visiting Komodo. The kids would love it! Appreciate the travel tips and beautiful photos. I’m sure your kids will love Komodo, especially the dragons! I loved your post. I am planning a trip with my partner soon. I have a question–is there any way for us to book a trip that goes by day to the Komodo and Rinca Islands, but return at night to our accommodations on Labuan Bajo? We wish to save $ and the live aboards are quite expensive. We haven’t booked this tour ourselves so it’s hard to recommend one. I would suggest checking on TripAdvisor for some reviews and them choose the best one. This looks and amazing experience, the Komodo dragons are amazing creatures. We love the instructions, keep your head down and don’t look at them directly. Also ‘never go to the toilet alone’ reminds me of the scene in Jurassic Park. We are glad you liked the post! I’m sold! Dragons, Diving & Trekking sounds perfect. My kids would flip over seeing a Komodo dragon and the snorkeling looks fabulous! Good to know you need to book a tour. A tour is essential especially if you want to see the dragons. I bet you kids would love the whole experience! This is definitely a location on my bucket list. The views look totally stunning but I am curious as to whether the dragons roam freely around the island or are mainly located in one area? The dragons are mainly located in 3 big islands. The Padar Island, where we did the trekking to the top of the mounting has no dragons, or at least they never recorded a big population there. At the other islands they are running free, so that’s why you need to be with a trained ranger and follow only the designed paths. Wow that place is beautiful. Or maybe I’ll just laze around in that pink beach… hm komodo is calling me! If you like be surrounded by nature, then Komodo Islands are the perfect travel destination. You can have adventure, adrenaline and relaxation at the same place. I’ve wanted to see a Komodo Dragon for years! And the diving/snorkeling sounds awesome! Thanks for putting together this great guide which will help me plan my trip and how many days to allocate to it. Indonesia has so much to offer it’s hard to fit everything into one trip! Indonesia is a stunning country with so many hidden gems, we need to go back to explore more as one trip wasn’t enough. What a stunning place, that first photo is like looking down a dragons back disappearing into the sea. An absolute dream to see the Komodo dragons, what an incredible experience. Never thought about it, but the picture does look like a dragon’s back. Maybe that’s why I was so fascinated with that view. I wouldn’t want to mess with those dragons. Glad dreams have come true, that is the charm of travels. I too wish to see these dragons but from a distance. The dragons look scarier than actually they are. If you follow the rules, it’s an amazing experience! 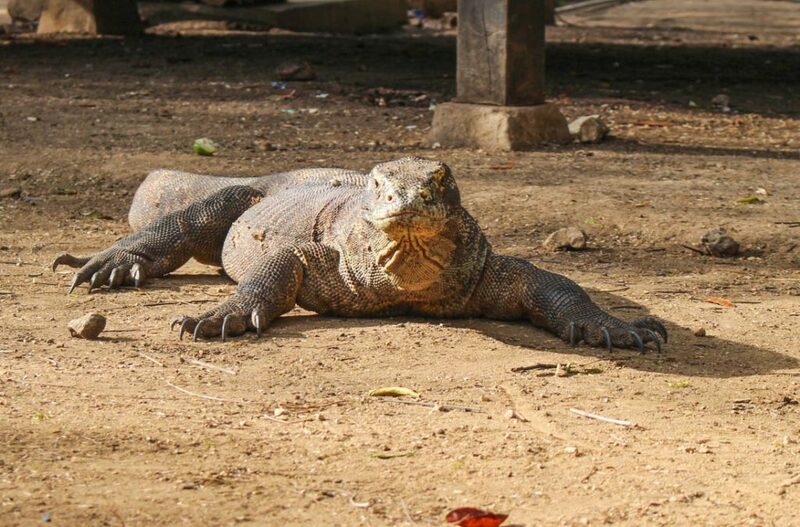 If you travel to Indonesia, you must visit the Komodo National Park, those big guys are scary but amazing! Wow, what a trip! I’d like to see this by myself, these beasts are so special! Useful post that is already in my pins board for (hopefully) future use. Thanks for sharing! If you have the chance travel to Komodo Islands, it’s an experience like no other. The Komodo Island is a magical place!! We are so happy to have the opportunity to see those huge dragons! Hi there, the trip to Padar Island, is that a seperate trip one has to book in Labuan Bajo? Better book your komodo tour through local agency in Labuan Bajo. you can bargain the price and note that please inspect the boat first before you book the tours. My name is Gabriela, from Petra Christian University Surabaya, Indonesia. Right now, I am currently working on my final project/thesis of: Travel Motivation in Visiting Komodo National Park (Padar island, Komodo island, or Rinca island). If you don’t mind, would you please fill in this questionnaire? Thank you very, very much, and God bless you. ?? Happy to help, already replied the questionnaire. Thank you so much for the help, Sir and Ma’am! Don’t stop travelling and be safe! how much is day trips to each island? The price depends on the type of the boat, hours of the tour and itinerary. I can’t give you the correct price. Here you can find a list of companies that offer tours to the islands. hiya, do you know how to get to this places from Gili Island? if so, pls can you explain to me ? It’s easier to travel to Komodo from Bali or Lombok. Wow such an amazing blog – thanks for your help. We have 6 days in Labuan Bajo – we are staying in a hotel. Do you recommend staying over on Komodo island? i was planning on doing day trips from Labuan but might be better staying over? Also how rough is the sea? i get sea sick. We did 2 day trips from Labuan to Komodo Islands, it was a bit tiring but doable. There are tours offering the overnight at the boat, next time we want to try. On both trips the sea was flat, no waves whatsoever. thanks for the tip and info. we are planning to go there next year to tick off our bucket list. Indonesia is a wonderful country! Thanks for the information Rob and Nat! We just came back from Malaysia and are planning on going to Indonesia for three weeks next summer (June 15 through July 8 2018). How far in advance should we start booking things? We are two adults and three kids (ages 12, 12, and 10 next summer) and we usually book all the hotels and activities ourselves. Would you recommend self-booking everything or should we go with a travel agency? We are thinking about going to Tanjung Puting National park in Kalimantan and then Komodo National Park before spending our remaining days in Indonesia in Bali and other areas. Believe 2-3 months in advance is ok. We prefer to book everything ourselves, Agoda and Booking are our choices to search for accommodation. Hey! Thanks for all the tips! Looks amazing! 🙂 I am going there now om september! Which company did you use? Did you book in advance or just close one there? Our trip was organized by the Tourism Board so we didn’t get to know the tour company. I suggest to check the latest tour’ reviews on Tripadvisor. Thanks, Natalie, for posting good ideas How to Plan a Trip to Komodo Island. Everyone wants to their tour should be amazing and memorable. So that they try different plans for their tour. If you are searching a beautiful spot to spend your holidays then Komodo Island tour is the best place. Before 4 months ago I had visited those places which you have mentioned in your post. Me and my friends had visited those places with the help of “Komodo Wanderlust Tour” a famous travel expert of Indonesia. Really that trip is an amazing trip for me. Loved reading your blog. I was debating whether to go or not to go to Komodo islands during our Bali trip but post reading your experience, I’m definitely going. A quick question I’m travelling with my parents, who are in their 70’s plus kids who are below 9. Would you know if they’ll be able to do the trek and are kids allowed in the park? Hi! I was wondering if I need to book a flight in advance (from Bali to Labuan Bajo) or if I can book it when I arrive in Bali. I’m coming from Canada at the end of April. Should I be booking now or waiting until I arrive in Indonesia? Also I’m travelling alone and would need to bring my backpack/luggage with me on the plane (65-75 L), otherwise I wouldn’t know where to leave it. Is it possible to bring it with me? Thanks! Sorry for the late reply, hope all went well on your trip. We always prefer to book the flights in advance. Regarding the luggage most airlines in Asia are pretty strict with cabin luggage, it’s around 7-10kgs only. Hi , Im so in love with the view in your first picture. May I know which island is that and when would be the best time to hike up for a view as such? Hope to hear from you soon, thank you. We were there in August, it was quite warm but we didn’t get rain. Thanks so much for your informative description. We are going there next month and your tour seems perfect for us, plus we will do the scuba diving portion. Like you, we plan to work out of Labuan Bajo. Who did you do your daily tours with? Can we arrange it before we go? Our tour was organized by the Indonesian Tourism Board. I would suggest checking on TripAdvisor for the best operators. Hello 🙂 I’m going to Indonesia in October with a friend and I’m completely in love with the places you visited! We already have the flight to Labuan Bajo and we will have 2 full days there! The tours you took seem perfect for our time schedule as we want to take the most of komondo islands! Could you advise us what were the companies/tours you took? Enjoy Indonesia, it’s a stunning country!! About the tours, I just added on the blog post a list of the best tours companies, it’s below the “How to Plan a Trip to Komodo Island in Indonesia?” session. I AM PLANNING A TRIP TO BALI I HAVE ONLY 6 DAYS IN BALI. I KNOW THAT ITS NOT VERY MUCH TO GO TO KOMODO BUT I REALLY WANT TO DO IT. WHAT YOU THINK? IS POSSIBLE TO ARRIVED TO LABUAN BAJO BEFORE MIDDAY, VISIT THE PARK STAY A NIGHT AND GO BACK TO BALI IN THE MORNING? I would suggest at least 2 full days in Komodo. Thanks a lot for the article. It’s really helpful. We are planning to visit Komodo Island in December this year. Just wondering when you stayed in Labuan Bajo and then took the trips to the mentioned islands lets say to Rinca island, did you go back to Labuan Bajo and stayed the night at your accommodation or you stayed over night in the boat for the next island in the next morning? I knew from the celeb news, Gwyneth Paltrow stayed in a boat for days during her visit with her children there. Is that option available and how to book that house boat? We LOVED Komodo! And yes, we stayed in a hotel in Labuan Bajo and took went to the islands during the day. The overnight boats are a popular option as well, we plan to do it on our next trip. We heard good things about those boat tours in Komodo. If you are interested in diving the Komodo area has great diving sites. Thank you so much for your informative article on Indonesia tour with awesome pictures which inspire any one at list once visit your visited all places. Can you please let me know about Visa process for Indonesia? I recommend you to contact the Indonesia Embassy or Consulate in your country, they can give you all the details about applying for the Indonesia tourist visa.